Va Right! Starts 2012 In Top 100 in THREE Technorati Categories AND Co-Winner of 2011 Fab 50 Blogs! | Virginia Right! Wow! What a year 2011 was! Once again, Virginia has blazed the way in the State Political arena and set the stage for what we anticipate will be another historic Republican victory in Washington in November. Following the Virginia Republican surge in 2009, Republicans took over the US House in 2010 and got a lot closer in the US Senate. We look forward to replacing not only Harry Reid as Senate Majority Leader, but President Obama as well in 2012. And the many events of the year allowed Virginia Right! the opportunity to provide coverage of these events. And we try to provide not only coverage, but opinions and thoughts as well. While we have a decided right lean to the blog, we do our best to provide fair coverage and honest opinion without spin and hype. This is not always an easy task and we will not always win friends and stroke the egos of people and groups who happen to align themselves on the same (right) side of center as we are. Much to the consternation of some who believe we should simply accept their version of reality, no one gets a pass. We will continue to respect honesty and integrity in our political leaders and we plan to continue to call those out who are (in out opinion) less than forthright in their actions and policies. When we believe criticism is earned and deserved, then criticize we shall. Much of the media today has taken sides. And the result has been a free pass for noteworthy misdeeds from those with similar alignment. It is much more prevalent on the left than on the right, but it exists at both ends of the political spectrum. If you seek pablum and shill-like affirmation of everything that emanates from anyone right of center, Virginia Right! may be of limited appeal to you. But if you seek honest coverage and honest opinion of people and events, that is why we exist. And we will continue to do our best to break down and analyze anything from polls to statements to political platforms. That is what Virginia Right! has done and that is the path we will continue to follow. And it is obviously a point of view that people find valuable. And Virginia Right! has appeared on the radar of a number of people and places worldwide. And while that notice and recognition is welcome, we consider it an award earned, not by those who blog or guest blog here, but by those who take time to read and consider the views and opinions expressed here. And who offer comments and opinions. And especially to those who disagree with out posts. While the opinions expressed here are our own, we respect and celebrate any and all opposing opinions. And we always appreciate anyone taking the time to agree or disagree. So, we call your attention to a couple of accolades Virginia Right! has been granted and attribute them, not to ourselves, but to those who read and find something of value to add to the political discussion on this site. And I think it is fair to say that without the contributions of my co-blogger Sandy Sanders, Virginia Right! would not be in the top 100 in any of the three categories. Sandy’s uncanny knack of uncovering the hidden purposes of ICLEI and Agenda 21 along with his United Kingdom Independence Party (UKIP) and Ron Paul coverages has added a depth and dimension to Virginia Right! that broadens the scope and appeal of this blog and brings readers that can experience and provide a great many more viewpoints and expose all readers to a far wider range of ideas than no single writer could ever hope to do. And posts by Michelle Stanley have added yet another voice to the dialog. 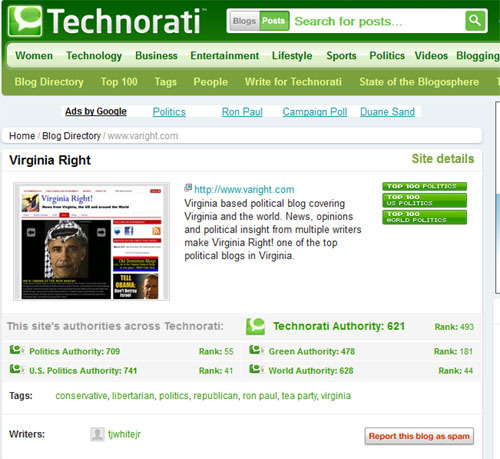 In addition to the triple ranking at Technorati, Virginia Right! shares an award with the members of the Watchers Council where all 15 blogs in the council (including Virginia Right!) 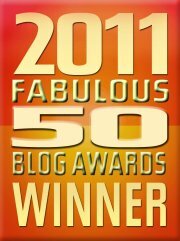 were named to the 2011 Fabulous 50 Blogs in the “Best Blog Ring” category. And if you are not aware of the work done by the Watcher’s Council, I will tell you that this is one of the most outstanding assemblies of first rate bloggers in the world and Virginia Right is humbled and honored to be a part of this amazing and outstanding group of individuals. You may have seen the posts here on Virginia Right! with nominations posted mid week and winners announced at the end of each week. The way it works is, each Tuesday all 15 members submit a post of their own and a post from any other blog or non-mainstream site. These are compiled and posted and then on Thursday, we vote on two posts by other members, a first choice and a second choice, and then the same for two non-council posts. The winners are tallied and posted. What this does is create a friendly competition each week among a group of right leaning writers to produce high quality posts and then face judging by other writers every week! It is like an exam on a weekly basis. I believe this makes us all reach a little higher and work a little harder to produce high quality posts that will be judged by our peers. Pressure? You bet! But this is such a talented group of people that none of the members have a problem not making the top posts. The competition is stiff and winning is not easy. And it keeps us on our toes! And Virginia Right! is also syndicated which helps with our National and International exposure. Before It’s News publishes stories from a number of sites, including Virginia Right! where every post on Virginia Right! is simultaneously posted on this very large site. And many of Sandy’s posts are syndicated at Freedom’s Phoenix, another highly popular news site. In addition, Virginia Right! is syndicated at NewsTex where our posts may be legally purchased and re-posted on other sites. What will come in 2012 is anyone’s guess at this point, but Virginia Right! plans to be in the thick of things and we have big plans for 2012! One of the most amazing things to me is how rapidly this blog has grown. It seems like I have been doing this forever, but the fact is, Virginia Right! will celebrate only our third birthday on March 9, 2012! I don’t know yet what we will do to celebrate turning 3 years old, but some bit of a festive nature will definitely be in order. We don’t know exactly what 2012 will bring, but we expect big things. And we wish one and all a safe, successful and happy New Year and please accept our sincere gratitude to all those that read Virginia Right! Sometimes it is a lot of work, but it is truly a labor of love and what we do is not for personal accolades or recognition, although those are a welcome thing, but to truly make America something that we can proudly pass on to future generations. And the America of today is not the legacy I or my generation would be proud to pass on. Collectively, we can all be a small part of correcting the course of the country and returning sanity, prosperity and, most importantly, God to the Country! I always wanted to have a hit record but I knew it would never happen so these Technorati categories are especially great. As Tim Tebow would say, I thank my Lord and Savior Jesus for all the opportunity to use my talents He gave me at this blog! This wonderful effort (and we are in fact 185th or about in the Green blog category as well – not bad for an anti-Agenda 21 blog!) is largely due to the leadership of Tom White. I thank Tom for his encouragement (even when we disagree!) and his selecting me to blog along with him. Let's go for top Hundred over all in blogs!